CUSAT M.Tech Admission 2018: The Cochin University of Science and Technology (CUSAT) is going to start its admissions for all the master’s programmes. The interested students can apply for the CUSAT Admission 2018 on the web page of the University. The admissions in M.Phil and PhD Programmes will be done on the basis of the DAT scorecard. This exam will be conducted by the authorities of the University. The CUSAT Application Form will be released in January. and the last date for the submission will vary according to the name of the course. The aspirants have to submit the CUSAT M.Tech Registration 2018. The forms will be made available on the official website of the University in the month of January. We will provide here the direct link for the submission of the CUSAT Admission Form 2018. The deadline for the submission of the form is in February. The students have to follow some precise procedure for the submission of the online forms. The forms will be available in Online modes. 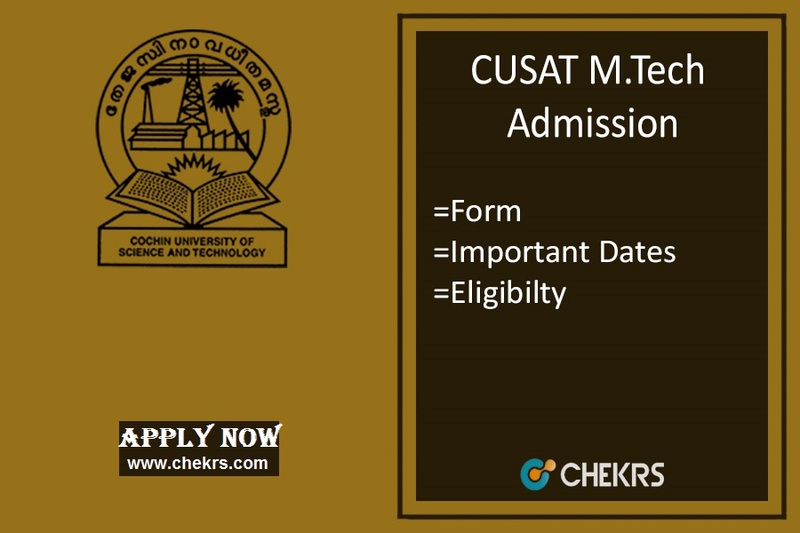 Steps to submit CUSAT M.Tech Admission Form. Then they have to click on the link regarding the online application form. Now open the link in new tab. Enter all the valid details like name, address etc in the form. The aspirant must note that the details must be correct. Now pay the application fee according to the name of the course. The aspirants have to pay an extra fee of Rs.10000 for opting Dubai as the exam centre. The fees will be paid via online and offline modes. For offline mode, the aspirants have to submit demand draft in favour of “Registrar, CUSAT” payable at Ernakulam. The International students with the valid visa can also apply. There are no such criteria is defined. The aspirant must have completed their bachelors in Technology from any recognized University. They must have scored minimum 60% marks in their graduation period. The students must have Valid GATE Scorecard for full-time admissions. For Part-time admissions, the GATE scorecard is not required. The aspirants who will have Valid GATE scorecard will be provided 5% relaxation in the qualifying exam for M.Tech. The aspirant must have passed Master’s Degree in the required stream from any recognized University. They must have score minimum 55% marks in the qualifying exam. Half of the seats are reserved for the University and college teachers. The aspirant must have Master’s Degree from any recognized University. Must have scored minimum 55% Marks in the qualifying exam. 10% concession will be provided to the reserved categories in the qualifying exam. The aspirants will be selected on the basis of valid GATE Scorecard. In the absence of GATE qualified students, the DAT Scorecard will be validated. The criteria are not same for Marine and Marine Btech streams. GATE scorecard is not valid for Marine engineering and the aspirants will be selected on the basis of their marks scored in the qualifying exam.